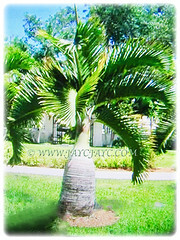 Bottle Palm is a very unique and stunning palm tree with a stout and bottle-shaped trunk. It has dramatic and wonderful arching foliage. Bottle Palm is considered critically endangered. Botanical Name: Hyophorbe lagenicaulis (syn. : Mascarena lagenicaulis). Common Name: Bottle Palm, Palmiste Gargoulette. Etymology: The genus Hyophorbe is when broken down into two, hyo means pig and phorbe means fodder, indicating that the tree’s fruit was fed to pigs. The specific epithet lagenicaulis is from two Greek words, lagen meaning flask and caulis meaning stem, referring to the plant’s form. Origin: Native to Round Island, off the coast Mauritius. 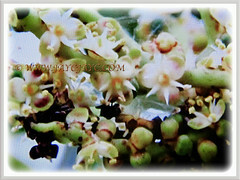 Features: Hyophorbe lagenicaulis is from the genus Hyophorbe that consists of five known species of flowering plants. A slow-growing palm that can reach between 3-3.7 m in height. It has a stout and bottle-shaped trunk. The trunk is swollen and rounded when young, becoming more elongated as the palm matures. 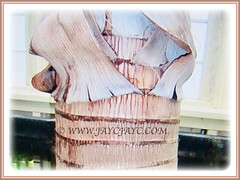 The trunk is smooth and greyish-white and topped with leaf scars from old and departed fronds. 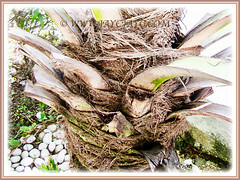 Bottle palm has only four to six feathery leaves open at any time. Though few, the fronds are long and graceful. It produces fronds that may grow 3.7 m in length with 0.6 m long leaflets. 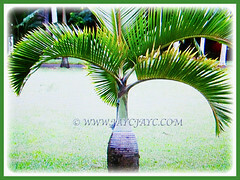 The dramatic and arching leaves extend to lengths of up to 3 m.
The flowers of the palm arise from under the crownshaft. This palm tree bears its common name, Bottle Palm due to the trunk’s strong resemblance to a bottle. 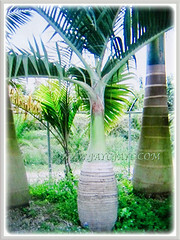 Culture (Care): Hyophorbe lagenicaulis or Bottle Palm can be grown easily with least maintenance. Light: Full sun to partial shade. It loves hot and humid weather. Moisture: Medium water requirement. It is moderately drought-tolerant once established. Soil: Humus-enriched and well-drained soils, though adaptable to a wide variety of soil types. Others: The Bottle Palm requires little pruning. Remove old leaves when they turn dry and brown. Cut the leaves close to the trunk but leave the base of the leaves intact. Be careful not to cut into the trunk. Hose the palm tree occasionally to keep the plant dust-free. Bottle palm benefits from regular feeding which promotes an attractive plant and increases resistance to pests and disease. 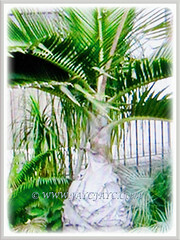 Use a special palm fertilizer which contains the correct ratio of nutrients for the tree. Alternately, use a slow-release granular fertiliser. 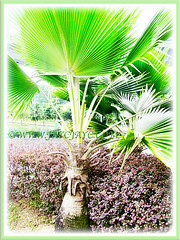 Generally, Bottle Palm is free from serious diseases and pests. However, do watch out for infestation of spider mite and small pests that hide in the stems of the fronds. Hyophorbe lagenicaulis or Bottle Palm does not tolerate frosty weather. It is very cold sensitive and is killed at 0°C or colder for any appreciable length of time. It may survive a brief and light frost but will have foliage damage. Advisable to plant in containers so that you can easily bring it indoors before any frost threatens. It makes a fine container-grown palm provided it is protected from the cold and not overwatered. 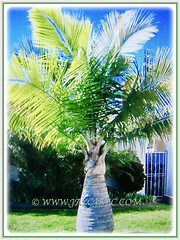 Feed the tree four times every year, namely in spring, midsummer, early fall and late fall with a special palm fertiliser. Propagation: Easily propagate from seeds that will germinate between 2-3 months. Usage: Hyophorbe lagenicaulis or Bottle Palm is a small and slow-growing palm that will be excellent as a specimen plant or accent in a garden. Being small, the Bottle Palm will be suitable to be grown in a container or large tub. 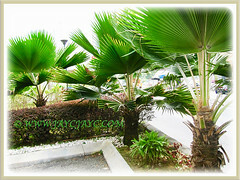 They are great dramatic palms for landscaping roundabouts, along road shoulders and highways. Ideal too as a container plant for a sunny patio.